As Trump Orders Border Wall, Mexico's President Mulls Canceling U.S. Trip : Parallels Many Mexicans are angry over President Trump's executive order to begin building a wall along the border. Some Mexican politicians are asking their president to cancel a planned meeting with Trump. Mexico's President Enrique Peña Nieto speaks during a news conference in Mexico City on Monday. He is waiting to hear from high-level negotiators before deciding whether to cancel his U.S. trip. Mexicans have reacted angrily to President Trump's executive order, which among many things directed the U.S. government to begin immediate construction of a border wall. Mexican lawmakers are urging President Enrique Peña Nieto to cancel his scheduled visit to Washington, D.C., on Jan. 31. Peña Nieto has not said whether he will cancel the meeting. In a video released late Wednesday, Peña Nieto said he is waiting to hear from his high-level negotiators who are meeting with Trump administration officials in Washington. 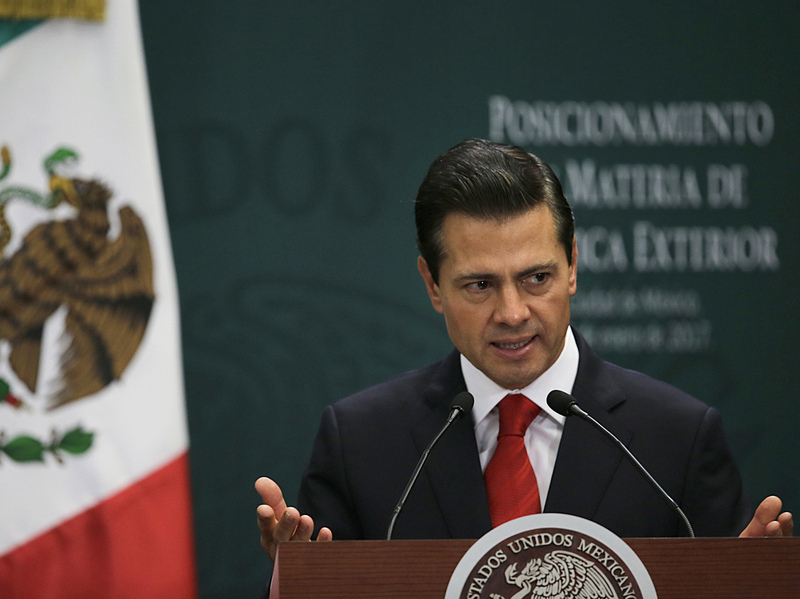 Depending on their report, Peña Nieto said he will decide what to do next. Speaking forcefully into the camera, Mexico's leader said he condemned the U.S. decision to build a wall, which he said divides instead of unites. "I have repeatedly said, 'Mexico will not pay for a wall,' " Peña Nieto said. Mexico's President Enrique Peña Nieto, speaking in Spanish, reacts to President Trump's announcement that the U.S. will begin building a wall along the border. "He has to say that," Trump countered, speaking in his first extended television interview as president. "But I'm just telling you there will be a payment." In the interview, which aired on ABC News on Wednesday night, he insisted Mexico will pay, maybe in a "complicated way, but they will pay." The executive order signed by Trump on Wednesday was written in a way that may allow the new administration to restrict aid to Mexico. Mexican Sen. Armando Ríos Piter, of the opposition leftist party PRD, says enough is enough. He wants President Peña Nieto to stand up to these threats and insults and call it what it is. "It's a hostile act, it's an unfriendly act and that's how we are going to start saying it all over the world," Ríos said. During comments on Wednesday, Trump did emphasize several times the importance of helping Mexico maintain a strong economy. That appears to have helped the flagging Mexican peso, which has taken a dive following every tweet and announcement from Trump since his election. On Wednesday, it gained more than 2 percent against the U.S. dollar.